Now that winter is over and the weather gets warmer, we can go back and start cooking outside once again. When it comes to cooking outside, we automatically think of outdoor grilling and smoking in our very own backyard, the standard activity for Labor Day weekend for many Americans (Memorial Day, 4th of July, and Labor Day seem to be the prime bbq'ing days). Hosting barbecues are often fun and easy to pull off especially when the food is plenty good. Ribs are a common staple in these barbecue events that everyone seems to love. 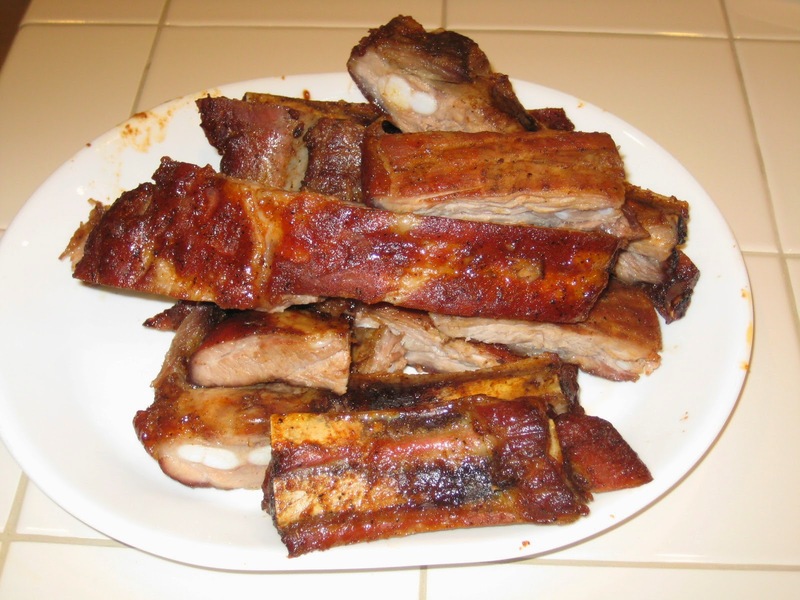 There are many kinds of ribs in varying recipes: there are pork ribs, beef ribs, Korean short ribs (called Kalbi), and even the McDonald's McRib. The Neelys (from Food Network's show Down Home with the Neelys and known for their good bbq) have many recipes just for ribs, but I particularly like the Memphis style barbecue spareribs recipe from the America's Test Kitchen episode Grilled Pork Chops and Ribs (season 11, episode 21) because you don't need a high-priced smoker nor do you need to be from Texas or Kansas City to make some good ribs. Some of these specialty smokers can be quite expensive (ie the big green egg) when all you need is one of those kettle grills (most likely made from Weber). It seems like every household has one of these Weber grills. I know someone who has had his Weber grill for over 30 years and the design hasn't really changed all that much after all these years. And if you're wondering, the difference between spareribs and baby back ribs are that spare ribs are longer and come from the front of the pig's ribcage. The reason why you can just use your Weber grill to smoke these ribs instead of a high priced smoker is that the whole point of smoking something is to cook something low and slow. A high-priced smoker makes it easier to control the temperature and to prevent it from getting too hot and overcooking your meat. When you cook something low and slow, it allows the collagen to break down and liquefy into gelatin which then gets absorbed by the meat. The meat, in turn, is tender and juicy. It takes time for collagen to turn into gelatin. When the temperature is too high, the meat just gets overcooked while the collagen never gets a chance to liquefy. You can turn your run of the mill Weber kettle grill into a smoker by following the proper setup outlined by America's Test Kitchen. Before seeing the exact way America's Test Kitchen does it, I would normally just dump some charcoal into the kettle grill and fire it up. This, of course, would make the grill too hot and give us tough meat. I say the most important part of this recipe is not the ingredients used, but setting up your grill the right way. The water in the pan serves 2 purposes. As mentioned in the ATK episode for ribs, the water makes the rib meat moist. Also, the water absorbs the heat emanating from the charcoal briquettes which is common for smokers because this prevents your smoker/grill from getting too hot which is what you don't want when slow cooking meat. Just added dry rub on your ribs. One thing the America's Test Kitchen video for Memphis ribs fails to do is to remove the membrane of the ribs. For some reason, in the video they just leave it on there which I highly discourage. The membrane is a thin skin-like layer on the bone side of the ribs. No amount of slow smoking on low will ever break this membrane done. You can easily look up ways to remove this membrane, but be sure to do so before you apply the dry rub. You definitely don't want this membrane on your ribs while it's smoking on the grill because it'll act as a layer shielding out the flavors of the rub and smoke that should be going to the meat. Not only that, but you certainly don't want to be biting into it once the ribs are done, so please make your life easier by removing this. When you remove the ribs from the oven, your ribs should have a nice crisp bark on the outside while still being moist and tender on the inside due to the long smoking process on low heat. The bark on the surface and the juicy inside give a nice contrast to your ribs. No one likes tough ribs or any tough meat for that matter. In general it is quite easy to overcook meat, but luckily if you follow the steps from America's Test Kitchen you can achieve tender fall off the bone ribs for your outdoor party. If you don't have an oven (ie if you're camping, picnicking, or tailgating at a football game), don't worry. This recipe still works in the absence of an oven. Just continue smoking on the grill instead until your ribs reach the desired temperature. Be sure to pair these ribs with some other Southern side like coleslaw, collared greens, baked beans, mac & cheese, or cornbread (and also have yourself a glass of bourbon while you're at it). Memphis Style BBQ Ribs ready to be sliced and eaten. You don't need an expensive smoker to make this recipe. All you need is a regular Weber kettle grill and an oven. I like to use smoked paprika instead of sweet paprika because I like the additional smokiness of the smoked paprika better. Be sure to remember to remove the membrane of the ribs before applying the dry rub. Look up how to remove it if you don't know how. 1. Combine the dry rub ingredients in a ball. Place the racks on a rimmed baking sheet; firs, remove the thin membrane on the bottom side of the ribs and sprinkle the rub on both sides of each rack, rubbing and pressing to adhere. Set the racks aside while preparing the grill. 2. Soak the wood chips in water for 30 mins and drain. Combine the vineger and apple juice in a bowl; set aside. Open the top and bottom vents halfway and arrange 15 unlit charcoal briquettes evenly on one side of the grill. Place a 9x13in disposable aluminum pan filled with 1 inch of water on the other side of the grill. Light a large chimney starter filled one-third with charcoal (about 33 briquettes) and allow to burn until the coals are half coated with a thin layer of ash, about 15 min. Empty the coals into the grill on top of the unlit briquettes to cover half of the grill. Sprinkle the soaked wood chips over the coals. Set the cooking grate over the coals, cover the grill, and heat the grate until hot, about 5 min. Use a grill brush to scrape the cooking grate clean. 3. Place the ribs, meat side down, on the grate over the water pan. Cover the grill, positioning the top vent over the ribs to draw smoke through the grill. Cook the ribs 45 min, adjusting the vents to keep the temperature inside the grill around 250-275 degrees. Flip the ribs meat side up, turn 180 degrees, and switch their positions so that the rack that was nearest the fire is on the outside. Brush each rack with 2 tbsp of the apple juice mixture; cover the grill and cook another 45 min. About 15 mins before removing the ribs from the grill, adjust an oven rack to the middle position and heat the oven to 300 degrees. 4. Transfer the ribs, meat side up, to a wire rack set over a rimmed baking sheet; pour 1.5 cups water into the bottom of the baking sheet. Brush the top of each rack with 2 tbsp more apple juice mixture; roast 1 hr. Brush the ribs with remaining apple juice mixture and continue to roast until the meat is tender but not falling off the bone and the thickest part of the roast registers 195-200 degrees on a food thermometer. Transfer the ribs to a carving board, tent loosely with foil, and let rest 15 min. Cut the ribs between the bones to separate and serve. best recap of the favorite recipe. my favorite part is the video to reinforce the text ! Hello @Unknown, I'm glad to hear that you've found both the recipe and the corresponding video to the Memphis-Syle Barbecued Spareribs from America's Test Kitchen to be very helpful. To replicate this method on a gas grill, we placed the soaked wood chips and water in disposable aluminum pie plates and set them on the burners. These modifications were so successful that the ribs only needed to spend 90 minutes on the grill. Hi @Unknown, thanks for the helpful tip! For those of us who have a gas grill, it doesn't necessarily mean that we have to forego the nice, smokey flavor on pork spareribs. You can pretty much put the wood chips in a foil packet or smoker box if you have one for the same effect. i reconfirmed other comments; this is the best recap of the ATK episode on cooking bbq ribs. Hello @Anonymous, I'm glad you find this information on America's Test Kitchen Memphis-Syle Barbecued Ribs very useful. It definitely helps when you're trying out a new recipe for the first time.